DNA has moved beyond esoteric science and into the center of everyday conversations about identity, culture and politics. It’s also reshaping stories about the past as advances allow scientists to extract ancient DNA (aDNA) from skeletons found at archaeological sites. With each ancient genetic sequence, scientists learn new information about how people moved around and interacted in the ancient world. In some cases, this has helped overturn theories and resolve age-old debates. But the aDNA “revolution” has also caused friction among geneticists, archaeologists and others over how this research is done. As archaeologists who collaborate on aDNA projects, we’ve witnessed these tensions firsthand. What lies at the heart of this rift, and how can these disciplines work together to better research humanity’s past? What’s behind the aDNA revolution? Ancient DNA changes how scientists do research, rather than the questions being asked. Geneticists are working on the same problems that archaeologists, anthropologists and linguists have wrestled with for decades, aimed at understanding transitions in the past and the roots of the modern world. But instead of looking at things people left behind, geneticists are interested in the people themselves. Skeletons are the only direct connection to individuals who experienced life in the past. Biological anthropologists have long studied bones and teeth looking for clues about people’s origins and lives. Now, geneticists can look at their DNA – providing a new level of detail and insight. The science behind aDNA is relatively new. The first fully sequenced ancient human genome – from a man who lived about 4,000 years ago in Greenland – was published only in 2010. At first this research was limited to skeletons from cold climates where DNA molecules are more likely to preserve. Success rates have steadily improved with cheaper and more efficient laboratory techniques and methods that target the most informative parts of the genome. One of the most important breakthroughs has been the discovery that a small part of the skull – the bony casing around the inner ear known as the petrous – is a rich source of aDNA, even in poorly preserved skeletons from hot climates. 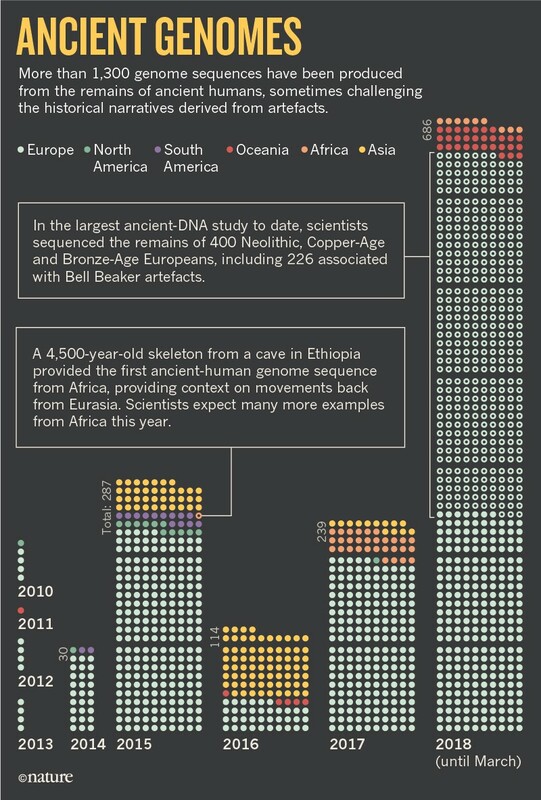 This finding has led to a massive increase in the pace and scale of aDNA studies, with thousands of individuals sequenced in 2018 alone and sudden widespread interest in archaeological skeletons in museums throughout the world. aDNA has thrust archaeologists and geneticists into new partnerships, where one side provides archaeological samples and questions, and the other additional questions, specialized labs and funding. These specialists, with different training and distinct work cultures, don’t always see eye to eye on study design, research pace or interpretation of results. Additionally, institutions and countries may not have explicit aDNA policies in place, leaving research teams and museum curators to navigate research and sampling protocols on a case by case basis. This has elicited concern from archaeologists, some of whom may worry the cart is so far beyond the horse that we should just cancel the trip. But like radiocarbon dating in the 20th century, aDNA has already fundamentally changed archaeology and will only become more prevalent. Understanding current misgivings now is the best way to move the science forward in a way that benefits everyone. Critiques of aDNA can be grouped into three categories: interpretive, ethical and systemic. Many concerns focus on how aDNA results are used to answer questions about the past. Most aDNA studies come from population genetics, a subfield that looks at major demographic changes over time – usually attributed to people moving or mixing with other groups, or both. But identifying these processes doesn’t tell researchers why they happened or detect their impacts on culture. Some critics suggest geneticists construct sweeping regional narratives about migration and population change based on a small number of skeletal samples. Others point out that this research relies on naming and grouping ancient peoples based on cultural evidence like pottery styles, which may or may not reflect biological relatedness. Ancient genetic sequences are also usually compared to modern ones from living people, who have their own complicated histories and are grouped based on language or ethnicity or both at the time of DNA sampling, making for potentially problematic comparisons. Ethical issues with aDNA affect both the living and the dead. In order to extract sequences, archaeological human remains must be ground up under special sterile conditions. Some targeted parts of the body – like petrous bones and teeth – provide valuable information about our species’ evolution and history. Since there’s not an infinite supply of archaeological bones, many scholars are calling for regulations to protect skeletal collections and ensure that future researchers can access them. Today’s scientists must also contend with past colonial practices that removed skeletons and artifacts from their countries of origin and sent them to Europe and North America, raising questions about who should now give permission for their study. Beyond the destruction of ancestors, aDNA findings can pose other harm to indigenous peoples. Because most aDNA studies have focused on skeletons excavated decades ago, few explicitly mention consultation with descendant groups. However, aDNA studies can have negative consequences for these communities. They can complicate land claims and repatriation efforts, undermine oral histories and reveal stigmatizing information like genetic susceptibility to disease. Findings about the past have present-day political implications depending on how they are received and mobilized. Underlying all these concerns are apprehensions about how archaeogenetics is developing as a field. A recent article in the popular press painted a dramatic picture of a high stakes game in which a handful of labs dominate access to samples and groundbreaking discoveries. Archaeologists are portrayed as fearful or helpless, exchanging samples for a minor authorship role without the ability to offer their own interpretations. But this hardly describes all archaeologists, many of whom occupy prominent positions on aDNA projects. Yes, competition for samples can factor into the fast pace of research and exacerbate some of the issues around aDNA. It is wrong though, to place blame on labs alone. An entire system comprising universities, scientific journals, funding bodies and the media stands ready to reward the next big discovery. Pointing the finger at individuals or labs only fosters division, pushing people away from aDNA research without addressing issues or finding solutions. Fortunately, change is already happening. Responses to the first wave of aDNA studies called for better integration of archaeological and genetic data and more nuanced questions about smaller-scale cultural and population shifts. Such change may end up occurring organically as the bar for publication shifts away from single sequences to studies of hundreds of individuals. Strict standards require genomic data to be made public, and aDNA research has become a model for the open science movement. This means more comparative data will become available over time to tackle fine-grained questions about regional histories. As aDNA is brought to bear on increasingly complex questions, archaeologists will need to take on more equitable roles in research design, interpretation and integration of multiple types of evidence. The field is also making headway on ethical issues. Ethics statements are appearing in journal articles. Museums are establishing their own guidelines. Archaeologists have stepped forward to suggest best practices for sampling and consulting with indigenous stakeholders. There has also been a push for better communication and outreach. The Summer internship for INdigenous peoples in Genomics (SING) is designed to help dismantle barriers between descendant communities and scientists. aDNA sessions and entire conferences bringing geneticists and archaeologists together are becoming more common. Establishing discipline-wide best practices and support through professional networks will reduce the burden on individuals to ensure research is done the right way. Communication and cooperation go a long way, but fixing the system ultimately requires a shift in how science is funded and rewarded. And the public has a key role to play as the taxpayers who fund scientific research and consume its findings. A scientifically literate society can demand work that meets ethical guidelines and provides meaningful insights about our past. Together, scientists and the public can set the tone for what aDNA research becomes and how we use it to explore our shared human heritage.